» How quickly do different cells in the body replace themselves? 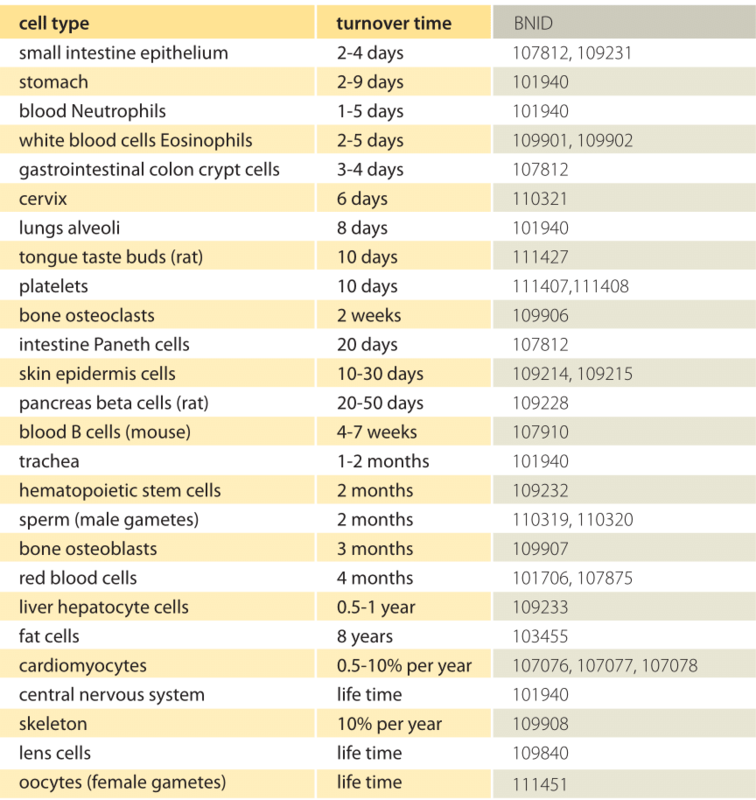 Table 1: Cell renewal rates in different tissues of the human body. Values are rounded to one significant digit. Giving context through daily life replacement processes, we note that hair elongates at about 1 cm per month (BNID 109909) while fingernails grow at about 0.3 cm per month (BNID 109990), which is about the same speed as the continental spreading in plate tectonics that increases the distance between North America and Europe (BNID 110286). The question of cell renewal is one that all of us have intuitive daily experience with. We all notice that our hair falls out regularly, yet we don’t get bald (at least not until males reach a certain age!). Similarly, we have all had the experience of cutting ourselves only to see how new cells replaced their damaged predecessors. And we donate blood or give blood samples without gradually draining our circulatory system. All of these examples point to a replacement rate of cells, that is characteristic of different tissues and in different conditions, but which makes it abundantly clear that for many cell types renewal is a part of their story. To be more concrete, our skin cells are known to constantly be shed and then renewed. Red blood cells make their repetitive journey through our bloodstream with a lifetime of about 4 months (BNID 107875, 102526). We can connect this lifetime to the fact calculated in the vignette on “How many cells are there in an organism?” that there are about 3×1013 red blood cells to infer that about 100 million new red blood cells are being formed in our body every minute! Replacement of our cells also occurs in most of the other tissues in our body, though the cells in the lenses of our eyes and most neurons of our central nervous system are thought to be special counterexamples. A collection of the replacement rates of different cells in our body is given in Table 1. How can the replacement rates of the cells in various tissues in our body be measured? For rapidly renewing tissues common labeling tricks can be useful as with the nucleotide analog BrdU. But what about the very slow tissues that take years or a lifetime? In a fascinating example of scientific serendipity, Cold War nuclear tests have come to the aid of scientists as a result of the fact that they changed the atmospheric concentrations of the isotope carbon-14 around the globe. These experiments are effectively pulse-chase experiments but at the global scale. 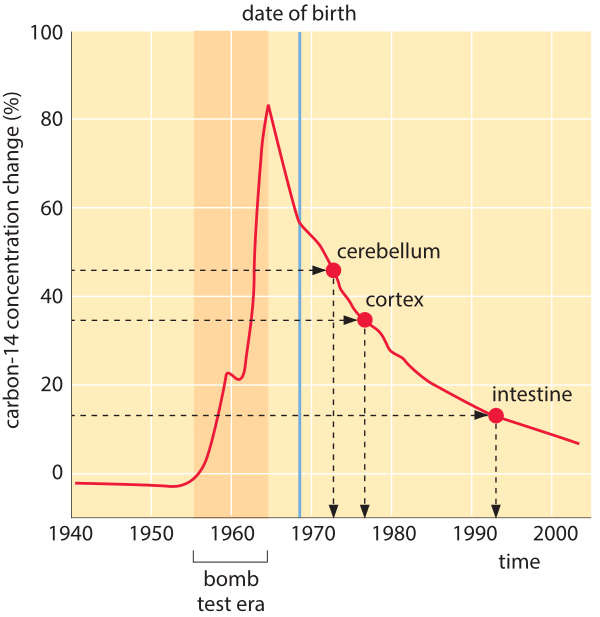 Carbon-14 has a half-life of 5730 years, and thus even though radioactive, the fraction that decays within the lifetime of an individual is negligible and this timescale should not worry us. The “labeled” carbon in the atmosphere is turned into CO2 and later into our food through carbon fixation by plants. In our bodies, this carbon gets incorporated into the DNA of every nascent cell and the relative abundance of carbon-14 remains stable as the DNA is not replaced through the cell’s lifetime. By measuring the fraction of the isotope carbon-14 in a tissue it is possible to infer the year in which the DNA was replicated as depicted in Figure 1. The carbon-14 time course in the atmosphere initially spiked due to bomb tests and then subsequently decreased as it got absorbed in the much larger pools of organic matter on the continents and the inorganic pool in the ocean. As can be seen in Figure 1, the timescale for the exponential decay of the carbon-14 in the atmosphere is about 10 years. The measured dynamics of the atmospheric carbon-14 content is the basis for inferring the rates of tissue renewal in the human body and yielded insights into other obscure questions such as how long sea urchins live and the origins of coral reefs. Using these dating methods, it was inferred that fat cells (adipocytes) replace at a rate of 8±6% per year (BNID 103455). This results in the replacement of half of the body’s adipocytes in ≈8 years. A surprise arrived when heart muscle cells were analyzed. The long held dogma in the cardiac biology community was that these cells do not replace themselves. This paradigm was in line with the implications of heart attacks where scar tissue is formed instead of healthy muscle cells. Yet it was found that replacement does occur albeit at a slow rate. Estimates vary from 0.5% per year (BNID 107076) to as high as 30% per year (BNID 107078) depending on age and gender (BNID 107077). A debate is currently taking place over the very different rates observed, but it is clear that this peculiar scientific side-effect of Cold War tensions is providing a fascinating window onto the interesting question of the life history of cells making up multicellular organisms.